For more than 50 years, we have created beautiful Easter egg cakes for families to enjoy. These colorful cakes are used as centerpieces, Easter gifts, and as a dessert treat for Easter dinner. What makes our Easter egg cake so special? 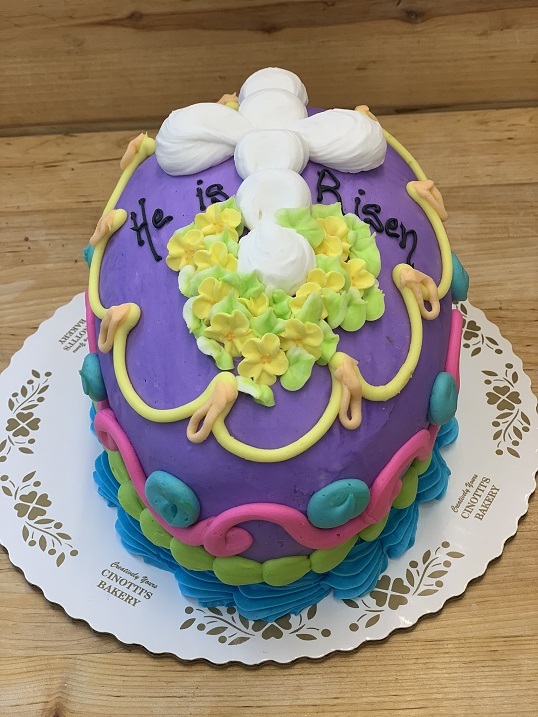 Our Easter egg cakes are made from scratch right here in our Jacksonville Beach bakery. Our master bakers use age old techniques to create cakes in various flavors such as vanilla, chocolate, Kylie, and more. If we won’t feed it to our own children, we don’t want to feed it to yours. Once cooled, our Easter egg cakes are ready for decorating. 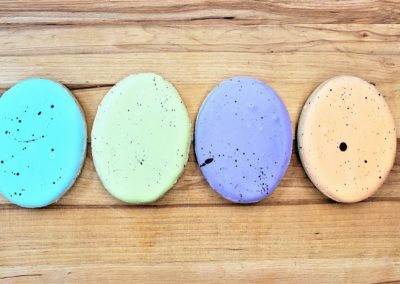 You’ll find an array of pastel, bright, and marbled colored egg cakes in our showcase and each one is individually decorated. 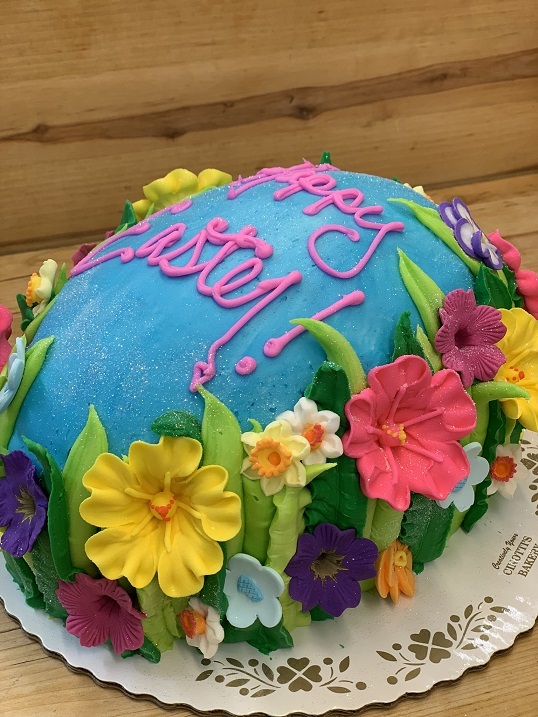 From blooming flowers to underwater paradise, we can create the perfect Easter egg cake for your holiday table. If you order well in advance, you can choose the flavor, color, and design for your egg cake. This year, we’re offering vanilla, chocolate, ½ & ½, and our famous Kylie cake (baked with colorful sprinkles). 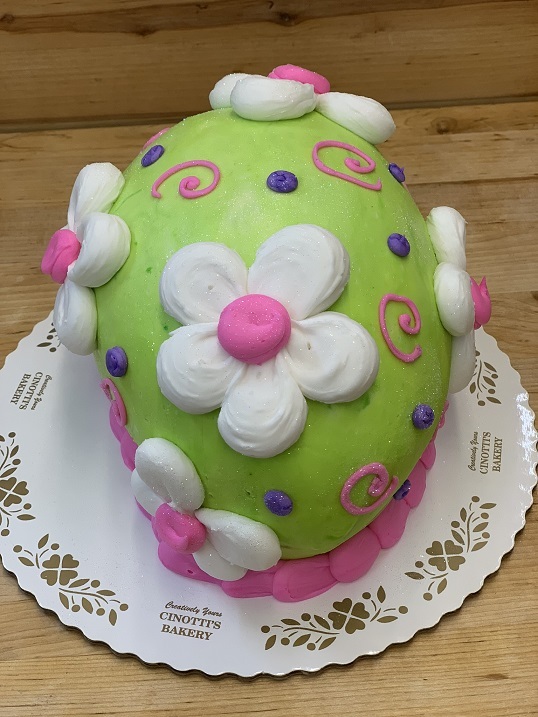 You can design your Easter egg cake with our homemade chocolate buttercream or vanilla buttercream in an wide range of colors. We recommend choosing an icing color that will match your overall design. Each of our Easter egg cakes is unique in its design. Traditional eggs include gentle icing swags, buttercream roses, and intricate details in pastel colors. Favored eggs can feature sugar paste flowers surrounded by Easter grass, puffy flowers in neon colors, or even a brightly colored underwater paradise. Eclectic eggs can include our famous plaid egg with nearly every color in our fandex, paint splatter design created with bright colors, and even cakes with lady bugs piped all over. Custom designs will be catered to your desires. If you want an orange and blue design with an over-sized gator piped on the top, we can create it. If you want an ornate Faberge egg design in pastel colors, we can make that as well. While we can create almost any design, we are limiting the amount of custom orders. We highly recommend placing all Easter orders by Wednesday, April 17. 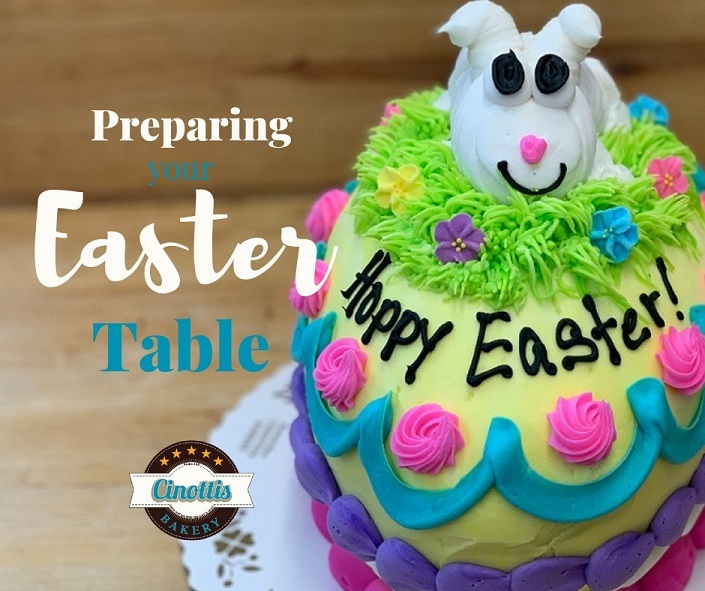 This will allow us to make final preparations and begin the process of creating the best Easter products for you and your family. Each year our collection of cookie cutters grows and this Easter is no exception. 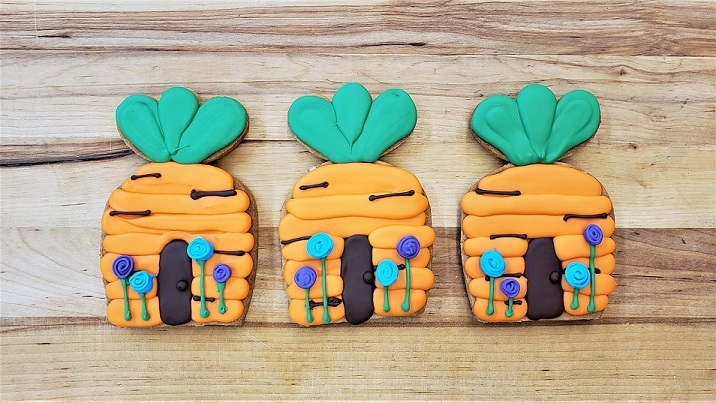 We have procured an array of Easter cookies that will bring happiness even the most stubborn bunny in your family. This Easter season, we will be unveiling our newly acquired cutters. 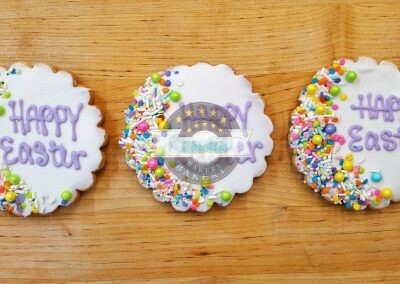 Don’t worry if you like those cute little cookies from last year, we will have those as well. From cute little bunnies popping out of an egg to the fun shaped carrot bunny house, our decorators have been busy this season. Bring your little bunnies in to see the colorful display case filled with hand-crafted goodies. You may see speckled eggs, traditional eggs, baby chicks, bunnies, Easter baskets, bunny faces, and more! 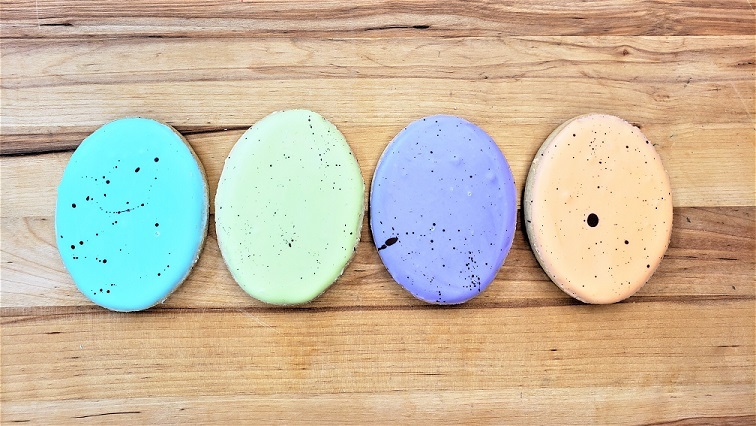 And the best part of it all is our Easter cookies are all made right here in our bakery in Jacksonville Beach. You and your family can enjoy our products without worrying about harmful chemicals. We use only non-GMO flours and we never add any preservatives or questionable ingredients. There’s no reason mom and dad should be left out of the Easter goodies. Our Easter cookie selection extends beyond decorated cookies to a more sophisticated selection… Bachelor Buttons. 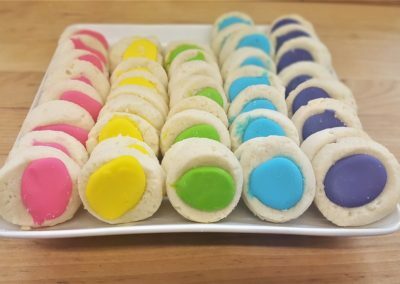 Bachelor Button cookies have been a crowd favorite for generations.These vanilla based cookies filled with sweet colorful icing are small enough to hide from your children, but pack enough flavor to sate any sweet tooth. Our Easter variety colors are the perfect addition to an Easter tablescape, or to bring as a hostess gift, or to simply snack on while preparing Easter dinner. 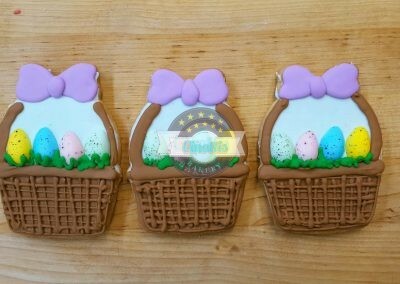 Order your Easter cookies soon! We love that you choose to bring our products into your home each year. 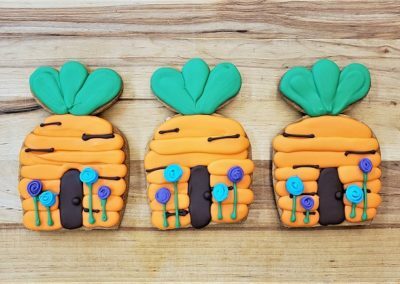 Our busy bunnies work hard to ensure you and your family have all the Easter cookies, cakes, and pies to fulfill your holiday. 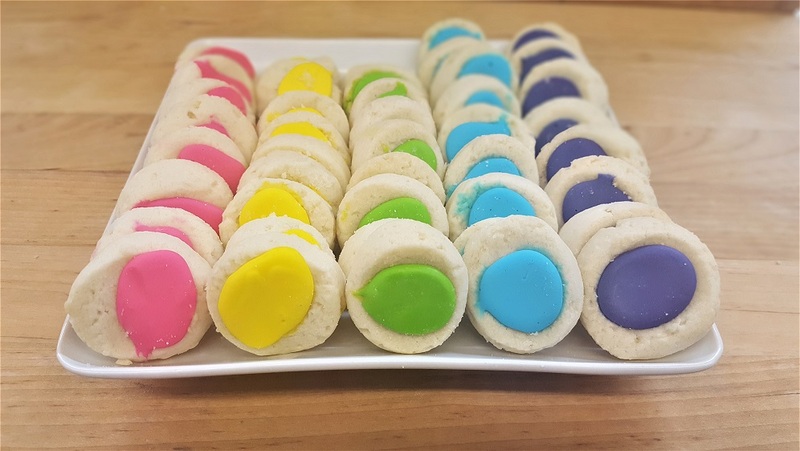 We strongly urge you to pre-order your cookies prior to Wednesday April 17th. 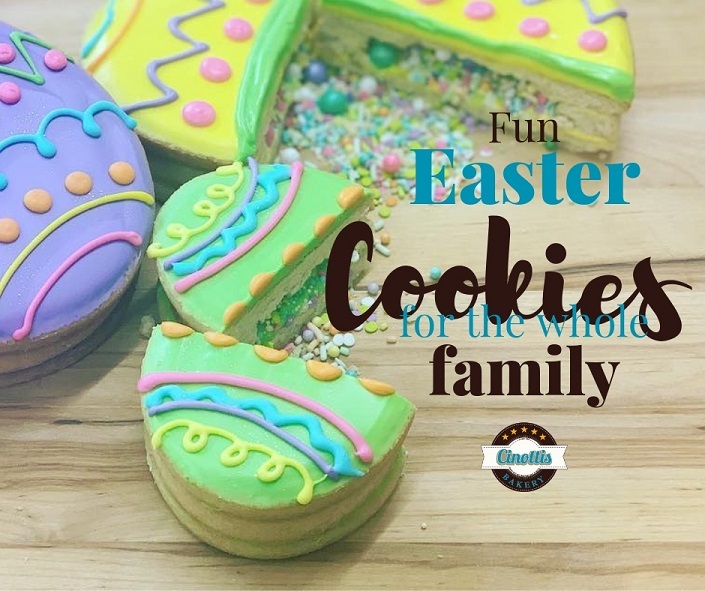 While our team will be producing Easter cookies throughout the holiday, we cannot guarantee specific cookies will be in stock the entire time. 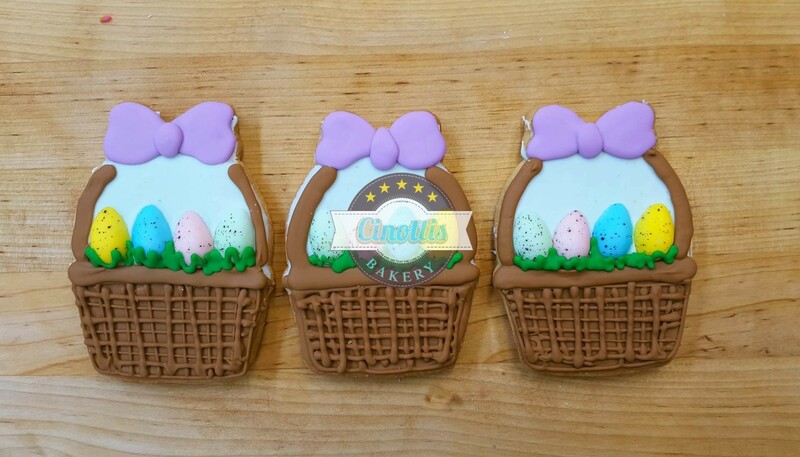 Peruse our Easter cookies page then give one of our friendly bunnies a call or follow that sweet scent of cookies into our bakery where we can help you plan the perfect holiday in person. Ash Wednesday kicks off a season of fasting and prayer for many Christians. Some may give up social media while others give up their favorite foods. In year’s past, some of our customers have chosen to abstain from sweets. Some have even chosen to completely give up coming to our bakery for the entire 40 days of Lent. 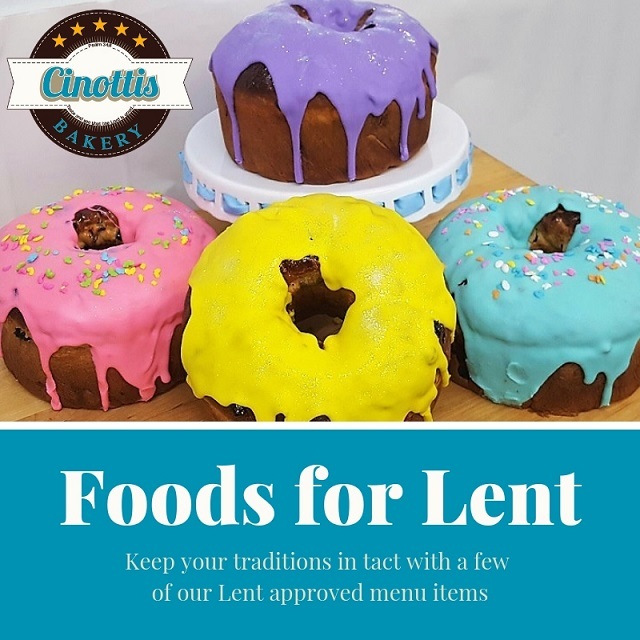 While we are honored to be such a big part of your walk, we invite you to consider alternative foods for Lent you may find in our bakery. Low sugar meals are a huge part of Lent traditions. But preparing foods for Lent that aren’t full of sugar can wreak havoc on your morning routine. If you’re tight on time on school mornings, hop in for a warm egg sandwich on a toasted bagel. We have cheese and bread options to suit almost every taste bud. And you can call your order in before leaving your house and cut your wait time down. 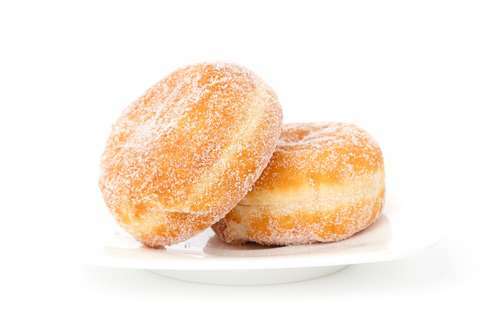 You and your little ones can fill up on a healthy meal and you can feel good about keeping your Lent promise…just close your eyes as you walk past the donut case. Oatmeal ranks high on the foods for Lent list for many reasons. Oatmeal is filling and low in calories making it the perfect breakfast for those watching their sugar intake. We have topping options that include brown sugar (add a smidge to your bowl for flavor), cinnamon (a natural sweetener), honey (from local farms), and milk. You can bring in your favorite granola or fruit toppings to mix in as well. Order a wheat bagel toasted with peanut butter and honey to start your morning off with a powerful breakfast. The protein packed peanut butter will keep you full while also providing ‘good fats’ which can aide in reducing cholesterol. And, we use locally grown honey which can help reduce pollen allergies and sinus inflammation. Perhaps the most iconic of breakfast foods for Lent is the Hot Cross Bun. Our buns are made of a buttery dough with red and green cherries as well as raisins. They are topped with a cross made of icing to give just a touch of sweetness to the dough. Move over Meatless Mondays. Fridays in Lent mean meatless meals for many families. Use UberEats or GrubHub to have a freshly prepared egg salad sandwich delivered right to your door. Ask for it on toasted white bread, wheat bread, or even an unleavened pita pocket. Most of our salads are served with chicken or meat of some kind, but during Lent, you can request a change of protein. Our salad plate is served with three scoops of prepared salads such as tuna, egg, chicken, macaroni, or potato on a bed of lettuce with tomatoes. Our chef salad is served with ham and turkey, but we can happily substitute the meat for added cheese or a meatless topping of your choice. If fish is an approved item on your foods for Lent list, try our tuna salad on toasted whole wheat bread. This delicious meal will not only fuel your body, it can also increase your brain’s ability to communicate to your nerve cells. Add a bit of romaine lettuce and a fresh tomato and you’ve got yourself a powerfully packed lunch. What are your favorite foods for Lent? Does your family celebrate with different foods for Lent? Come on in and share some of your favorite family traditions, foods, and activities. For Thanksgiving week, we change our hours in an effort to provide the freshest baked goods for everyone. Our hard working staff work around the clock chopping, weighing, baking, and decorating cookies, cakes, pies, and full dinners. To show our appreciation to our dedicated staff family, the entire bakery shuts down from Thursday through Saturday of Thanksgiving week. Monday November 19, Tuesday November 20, and Wednesday November 21, we will be open from 6am to 5pm. During our open hours, we will stock our shelves with all the Thanksgiving treats and traditions you’ve come to expect over the years. 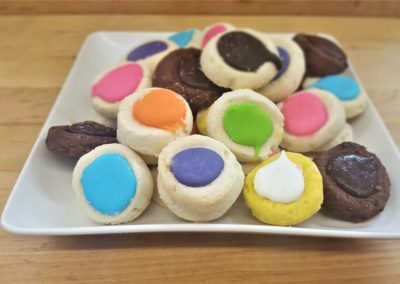 While we will be working hard to provide fresh cookies, cakes, pies, and breads for the community, we cannot guarantee anyone an item without an advanced order. 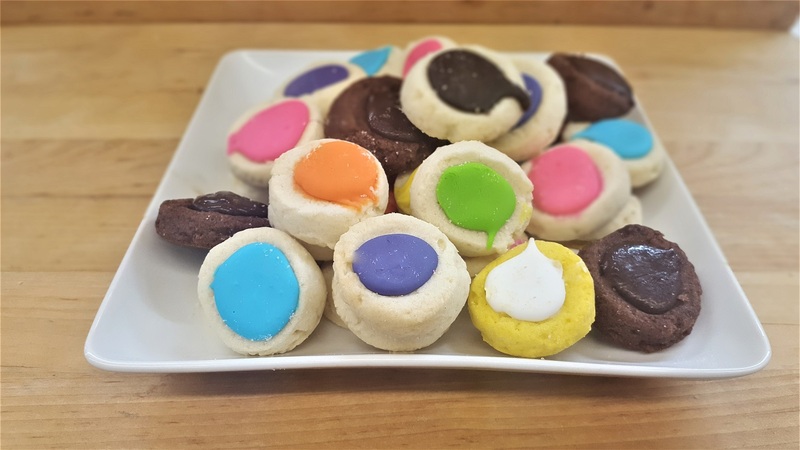 If you have a special cookie in mind to share with your loved ones, we strongly urge you to call or come in to place your order before noon on Monday November 19. We will not accept or change any orders submitted after noon on Monday November 19. With the thousands of order we have to process in two days, there is no way to search, add, or cancel any pre-existing orders. We will, however, strive to stock our cases with cookies, pies, rolls, cakes, and breakfast goodies. These treats will be available on a first come, first serve basis. Unfortunately, our entire staff will be busy preparing the thousands of baked goods over the three days of Thanksgiving week. While we will try to answer emails, we cannot guarantee it will be in a timely manner. Turkey: Preheat oven to 325. 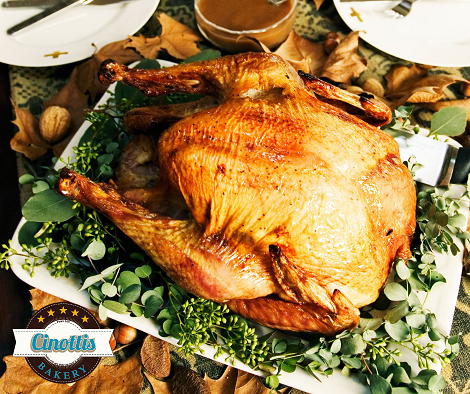 Remove plastic wrap and leave the turkey in foil pan-do not remove top foil. Heat in oven for approximately 1 1/2 hours or until the internal temperature reaches 165°F. Remove the foil, carve and enjoy. Side Orders: To reheat the side dishes, preheat oven to 325. Please remove the top of the container and cover with foil if desired. Reheat side dishes for 30 minutes or until internal temp reaches 185 degrees. Rolls: Pre-heat oven to 300. Remove the rolls from the package, cover with foil, and heat in the oven 10-15 minutes or until hot. No matter what you serve or who you choose to prepare your holiday meal, we sincerely hope you spend the day making memories with loved ones. We are thankful for your understanding of our staff’s much deserved days off during Thanksgiving week. And we are especially thankful for your continued support of our family business. Celebrate Easter with a Traditional Easter Egg Cake! With Easter hopping on our heals, most families are busy preparing their traditional celebrations. These traditions are important whether you plan on attending Easter Services, enjoying a large family gathering, or attending the neighborhood Easter egg hunt. And, as much as we plan our day around our faith or traditions, one elemental item seems to be prominent in Easter celebrations. The food. And, with the popularity of the Easter egg, we have an item that fits into both categories… The Easter Egg Cake. Our Easter Egg Cake is a pleasant compliment to any Easter table setting. And, you don’t have to worry about refrigeration. Leave this work of art out during your gathering as added decor to your day. Each cake will serve up to ten guests and is available in vanilla, chocolate, or Kylie cake. You can also have a layer of vanilla and chocolate upon request. 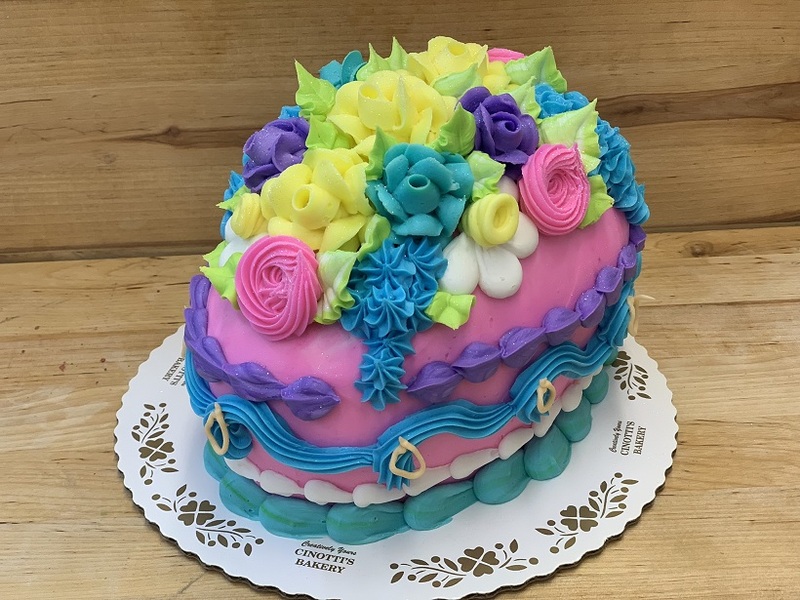 This colorful cake can be created in most colors to create your perfect design. We offer these cakes with both traditional and contemporary decorations. 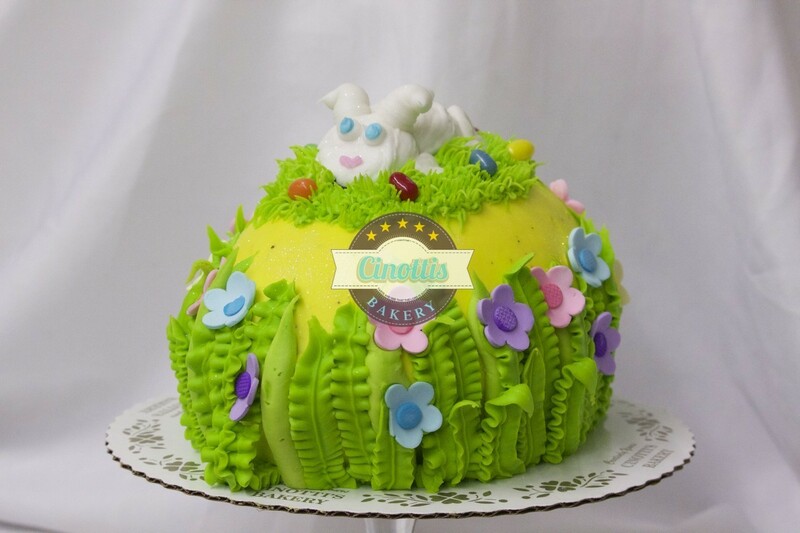 A traditional Easte r Egg Cake is made with various color combinations, designs, and flavors. This may include colorful swags, buttercream and sugar flowers, and of course, jelly beans. A contemporary Easter Egg Cake has more of a modern twist. Still available in a multitude of colors, decorations include puffy flowers, underwater scenes, grass and gumpaste flowers, piped bunnies, and more. In addition to the beautiful centerpiece our Easter Egg Cake offers, we also offer small dipped eggs. Our dipped eggs, while not available in various decorations, are offered in multiple flavors. 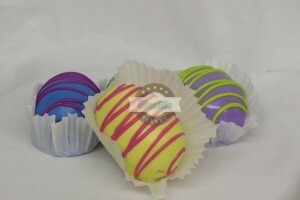 Vanilla cake eggs are dipped in fun Easter colors and drizzled with a coordinating color. Our chocolate dipped eggs may be filled with buttercream or you can order them without filling. Both are dipped in warm chocolate ganache. Want a different flavor? We also offer dipped eggs in Carrot cake and Kylie! These mini eggs are a wonderful twist on custom place settings or as an added dessert to your Easter meal. Using these mini eggs around your table to coordinate with your Easter Egg Cake, you’ll create a decor unlike any other. As always, we strive to create a unique experience for all our customers. We believe time is a precious resource. That’s why, we have created an Easter product menu to encompass a wide range of items. 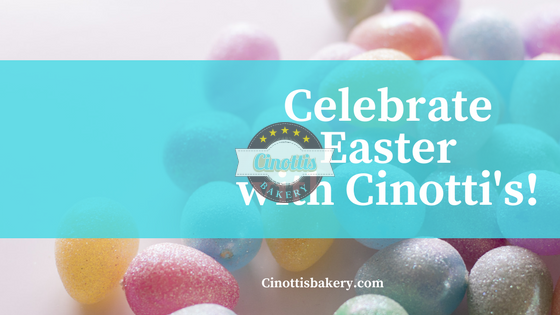 From our Easter Egg Cake and small dipped eggs, to our Deviled egg trays and fresh made breads, we’re confident you will find what you need all in one place. Ready to plan your Easter meal? Give one of our sales staff a call today. We’re here and ready to serve you in any way possible.